Cardinal Vincent has written a pastoral letter reflecting on the synod and the importance of the family to be read out in parishes this Sunday, the Solemnity of All Saints. In the letter Cardinal Vincent spoke of the work of the synod which centred around ‘fashioning fresh ways of thinking about the family in the plan of God’. 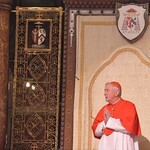 Of the many images of the family that emerged, the Cardinal noted that it was a ‘reflection of the mystery of love which is the life of God’ and ‘the flesh of the Church’. He explained that synod participants in small groups ‘shared together what we treasured most about our own family life’. They also spoke about the challenges that are faced by families, such as ‘poverty; an absence of faith; a reluctance to speak of faith at home; the drama of being refugees or migrants; the breakdown of a marriage in the pain of divorce and the fact of people entering a second civil marriage’. Cardinal Vincent said that the main work of this Synod was to ‘fashion the right response of the Church to many of these situations’, which included ‘a patient accompaniment, a readiness to listen, a gift of time and attention to one another’. He spoke of this as the ‘pathway for us all to take’. He expressed his hope that all ‘may draw from this Synod of Bishops great encouragement for our family life and for the life of the family of the Church’.